Pininfarina outlines the thinking that went into the design language of the show-stopping new Ferrari FF and how its forms and volumes aim to achieve perfect harmony between the car’s sporty spirit and its extraordinary versatility. Pininfarina's design ability, which is fresh from creating the stunning 458 Italia, is now further epitomised by the new FF, the fastest and most versatile four-seater in Ferrari’s history, as well as the brand’s first four-wheel drive model. 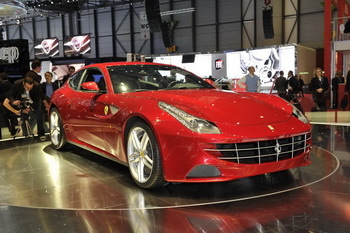 The Ferrari FF made its public debut yesterday at the 81st Geneva Motor Show and is one of the show-stoppers. Designed by Pininfarina in cooperation with the Ferrari Style Centre, the car’s forms and volumes achieve perfect harmony between the car’s sporty spirit and its extraordinary versatility. The FF is a perfect blend of technological and architectural innovation, conveyed by compact, streamlined styling, which expresses the concepts of essentiality, efficiency and lightness that underpin the latest developments in the Ferrari range. Plus, like all Ferrari GTs, aesthetics that communicate the strong sportiness of the aerodynamics, but never overlooks the traditional elegance of the design. It has been a very difficult challenge in stylistic terms, because of the untypical volumes of this new Ferrari. In architectural terms, the FF was designed to extend interior roominess, increasing the longitudinal space for the rear seats, so that even passengers up to 185 cm tall will be comfortable. The designers concentrated their attention on achieving taut, dynamic lines that make the luggage compartment lid lighter and more slender from the side. 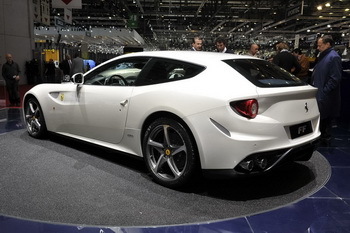 They tackled the concept of the ‘shooting brake’ with the target of giving the car a strong personality, highlighting the design of the rear end which is unusual for a Ferrari. Their research was immediately focused on captivating, dynamic and sporty proportions. The end result is a “missile” whose rear volume underlines and streamlines the rest of the car. The goal was to make the volumes “leaner and cleaner”, with treatment that makes the car compact and fluid. For example, a slight concavity is created in front of the front wheel, reducing the volume of the bumpers and enhancing aerodynamics; sections are hollowed in the bonnet between the wings and the central nose, going very close to the engine, but always respecting pedestrian impact standards; on the sides, convex and concave lines combine fluidly to eliminate superfluous masses; concavities are created in the rear end; the light clusters are recessed in the body. Much of the refinement was concentrated on the rear: different concepts were developed for the volumes to analyse how the car reacted to more sporty or more classical designs, until the final solution emerged, a summary of all the most captivating ideas. On the side, the elements of the original inspiration are never abandoned (for example the air outlet on the front wing), and the designers concentrated their work on the proportions and refinement necessary to give the car a compact side view. The door, for example, which goes from convex sections in front of the handle to concave sections that create the air outlet on the front wing. On the front, boomerang headlights and the shape of the grille underline the car’s personality. The grille is typical of the top of the Ferrari classic range, but with an innovative element: the absence of the chrome surround, replaced by a characteristic moulding on which the bars are positioned. Attention is thus drawn to the grille, which seems to “issue” from the body of the car to rest on the bodywork. In the front light clusters, for the first time the headlight washer/wipers are positioned on the sides of the lights themselves together and, as they are on the 458 Italia, the direction indicators and vertical LED DRL are two “gems” that give the headlights a very original look at night. 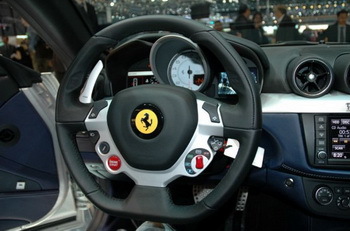 The car manages to communicate Ferrari’s characteristic sportiness even from the rear. The proportions of the rear window are excellent, and it rests firmly on the body. The egg-shaped rear end and circular double light clusters stand out. The treatment of the oval elements is modern and innovative, with concavities that increase as the surfaces slip towards the outside and the lights. In the lower part of the rear, which maintains the sloping aerodynamic effect, a horizontal wing appears to be suspended, supported by two vertical drifts with flat bottoms.